3700 Collection Residential/Light Commercial Single Locking Grade 2 Interconnected Door Lever Set. 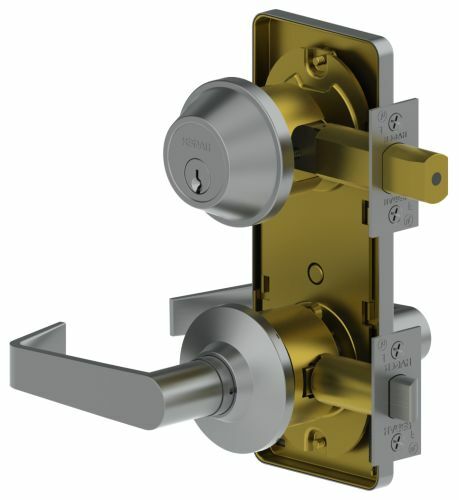 The Hager 3710 single lock interconnected door lever set allows the retraction of the deadbolt and the deadlatch by turning the interior handle. From the exterior the deadbolt can only be unlocked by key. The handle is not keyed. It is offered in three ADA compliant lever styles and a variety of cylinder options. Hager 3700 Series Grade 2 interconnected lock is a perfect match for residential or commercial applications such as apartment buildings and assisted living facilities. These versatile locks provide a single action for retracting the latchbolt and deadbolt simultaneously for panic-free egress. They are supplied with an optional exterior escutcheon plate standard and are backed by a lifetime warranty. Deadbolt is keyed from the outside with an ADA compliant thumbturn on the inside. Includes the optional exterior escutcheon. Suitable for heavy duty residential use. Suitable for medium duty commercial use. UL Listed for all functions up to 3 hours. 1-3/8" - 1-3/4" Door Thickness. 3/4" (18 mm) diameter stainless steel bolt with 1/2" (13 mm) throw.2-1/2" Rose Diameter. Archer Lever: 4-3/32" Length; 2-5/16" Projection. August Lever: 4-1/2" Length; 2-11/32" Projection. Withnell Lever: 3-15/16" Length; 2-5/16" Projection.